If all horses could talk like the famous Mister Ed, their caregivers would not have to debate the ethicality of so many issues involving this steadfast creature. Because they cannot communicate verbally, we need to find other ways to interpret their language. In adopting an understanding approach to horses and horsemanship, humans have developed a stronger relationship with the horse, drastically changing several aspects of the industry. In 1998, the film "The Horse Whisperer" caught the news media's attention, gaining some credit for the widespread popularity of "natural horsemanship." This training method has taken off like Secretariat in the 1973 Belmont Stakes, allowing cowboys and dressage equestrians alike to gain incredible results while working with the horse, rather than against it. 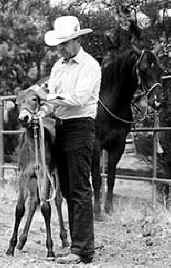 Known for imprint training of foals, a form of natural horsemanship, Dr. Robert M. Miller, Thousand Oaks, Calif, reviewed this revolution in horsemanship at the AVMA Animal Welfare Forum, presented Dec 8, 1999 in partnership with the AAEP in Albuquerque, NM. Dr. Miller said, "Credit for the onset of this change [to natural horsemanship training] has been generally credited to a Northern California horseman, now in his 90s, Tom Dorrance [1999 recipient of the AAEP Equine Welfare Award]. ... Using technically correct behavior-shaping techniques, several of Tom's protégés went on the road doing teaching clinics. The success of these clinics and the success of the methods taught to them encouraged other talented horsemen to join the movement and, by the mid-90s, what has become popularly known as 'natural horsemanship' — because it is natural to the horse, not to the human — was being accepted and advocated all over the world." Traditional horse training methods have involved force and coercion. "They are less than optimally effective, however, because pain elicits fear in the horse, and the horse, being a flighty creature, is motivated to flee when afraid," Dr. Miller said. Studying a horse's behavior in a herd environment, Dorrance and others have found the animal is naturally inclined to follow the herd leader. Using natural horsemanship techniques requires the trainer to assume body postures similar to a dominant horse, Dr. Miller said. "The techniques used inspire the horse to regard the human as a herd leader and to want to follow and be subordinate to that leader. Done correctly, natural horsemanship produces a horse devoid of fear but filled with respect for the human who does the training." Dr. Miller explained that the technique has become more successful because of the "information explosion," which allows horse owners access to more information than formerly possible; greater understanding and acceptance of psychology; the increased involvement of women, who, "as a rule" are seen as more compassionate, in the horse world; and changing values of society toward the humane treatment of animals. Bernard E. Rollin, PhD, professor of philosophy and biophysics and director of bioethical planning at Colorado State University, said, "Whereas 20 years ago one would have found no pieces of federal legislation bearing on animal well-being, more recent years have witnessed around 60 such proposals each year in Congress alone, ranging from attempts to prevent duplication in animal research, to saving marine mammals from becoming victims of tuna fishermen, to preventing importation of ivory, to curtailing the parrot trade." Society's changing values toward animals was partially responsible for changing laws in California. In 1998, California became the first and only state in which it is illegal to slaughter horses for human consumption or ship horses out of state to be slaughtered for human consumption. Concern arose not only because Californians couldn't bear the thought of their backyard pets ending up on dinner tables but also because of the shipping conditions most slaughter horses endured. Dr. Venaye P. Reece, equine programs coordinator for the South Carolina State Veterinary Office and former AAEP welfare committee member, worked extensively on the equine slaughter transport issue.” It’s been a controversial issue, and the issue of slaughtering horses for human consumption is a very emotional one. It's one that depends very much on geography, and cultural and ethical questions. ... In all cases the animal must be handled in a humane manner." In five years, potbellied trailers may be phased out for shipment of horses. "The major markets the United States sends [the final] product to are in Europe, mainly Belgium, France, Italy, and Japan. The producers are the United States, Canada, Australia, South America, and Mexico," Dr. Reece added. In studying transportation issues in the United States and Canada, Dr. Reece and others have collected data about exactly who the owners are and what type of horses are being shipped to slaughter. "We certainly worry about the origin — where are they coming from? Where are they getting these horses? How are they gathering them? How are they transporting them? What about assembly points in feedlots?" Focusing mostly on transport during her presentation at the Animal Welfare Forum, Dr. Reece said, "Water, food, density [of horses on trailers], proper vehicle construction, and injury have all been of concern, and we are trying to address this as much as we can." Horses shipped for slaughter travel long hours because only three plants that process horse meat exist in the United States. In 1996, Congress passed the Safe Commercial Transport of Horses to Slaughter Act. "This gave the USDA authority to develop and implement regulations as funding became available," Dr. Reece said. A federal regulation has now been proposed, possibly to be adopted in spring 2000. The regulation will address accountability from the point of purchase to the point of slaughter; inspection on arrival at the slaughter plant; ability to investigate, charge, and prosecute violators; a five-year phase-out of double-deck trailers (originally designed to haul cattle); segregation of stallions and aggressive horses; and a ban on shipping mares that are close to foaling. Another law designed to safeguard equids, the Horse Protection Act, was enacted by Congress in 1970 to prohibit the practice of exhibiting, showing, or selling sored horses, particularly Tennessee Walking Horses. "[Soring] is declared in law as being cruel and inhumane and [a practice] that provides an unfair competitive advantage for the violator," said Dr. W. Ron DeHaven, deputy administrator, USDA-APHIS Animal Care Unit. The act is administered by APHIS. A Tennessee Walking Horse displaying the "big lick"
"The Tennessee Walking Horse has three natural gaits: the flat walk, the running walk, and the canter. The term 'big lick' is used to describe an exaggeration of these gaits in which the horse has a big reach in front and substantial overstride behind," Dr. DeHaven said. "It is the big lick that crowds of people come to see and cheer, and the judges award. Unfortunately, some methods used in training horses to display this animated gait are abusive; in the industry, such practices are termed 'soring.'" Under the Horse Protection Act, violators can be punished by a fine and elimination of their horse from the show or sale ground. 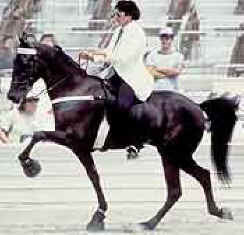 The act does not make it illegal, however, to sore a horse outside the show ring or sale grounds. Soring continues, and trainers seek new ways to mask it from designated qualified persons (industry-trained show inspectors) and USDA veterinary medical officers. The Tennessee Walking Horse industry contributes $375 million to Tennessee's economy. Some champion stallions sell for over a million dollars. Trainers felt it was necessary to "enhance" their horses' gaits to keep up with the naturally high-stepping American Saddlebred. The big lick drew large audiences, and soring of horses increased, even though the big lick can be achieved through hard work and training. "[Soring] can be accomplished through the application of chemical irritants such as mustard oil, croton oil, diesel fuel, gasoline, turpentine, cinnamon oil, kerosene, or even hand cleaner. A carrying agent, such as DMSO, is sometimes used to drive the irritant deep into the underlying tissue. The horse's feet and ankles are then wrapped in a plastic wrap and regular leg wraps to 'cook' the irritant into the horse's limbs," Dr. DeHaven said. Chains are fastened around the front pasterns and, during training, strike against the sensitive areas, further enhancing the gait. Despite the public's abhorrence of soring, Congress set the maximal funding for enforcement of the Horse Protection Act to $500,000 per year, and current yearly funding is $350,000. "This funding level limits the activities USDA can conduct on its own to enforce the act on a national basis," according to Dr. DeHaven. "A conflict of interest with the designated qualified persons program has been a problem, often characterized as the 'fox guarding the henhouse' due to the close affiliation of some DQP with the industry. At best, it is a stressful situation for the DQP to inspect the horse of a friend or a fellow trainer, especially if that person may be judging a future show where the DQP or his family will participate," Dr. DeHaven said. Dr. DeHaven said a USDA-proposed operating plan enacted during the 2000 show season should give Tennessee Walking Horse show participants a better understanding of the rules. The Walking Horse Report, www.walkinghorsereport.com, posted explanations of the rules. The plan attempts to clarify issues and problems to ensure consistent and at least minimal compliance and enforcement. Another industry performing self-regulation has drawn attention from animal rights activists. Pregnant mare urine provides estrogens to manufacture Premarin, a hormone replacement for women. Some people are concerned about the well-being of the mares, kept indoors October through March; others about the offspring, which could end up in slaughterhouses. PMU ranchers, those who manage mares that produce urine, are also criticized for regulating water intake through intermittent watering and keeping mares in tie stalls without adequate turn-out. Dr. Douglas A. Freeman, director of the Equine Studies Program, University of Massachusetts Department of Veterinary and Animal Sciences, is co-chair of Wyeth-Ayerst Global Pharmaceuticals, a company that is supplied urine by PMU ranchers. Dr. Freeman said, "The horses' access to water is managed in order to maintain appropriate stable hygiene. ... Groups critical of the PMU industry have alleged that these systems do not provide adequate water for the mares, and that the ranchers restrict water to the mares in order to produce a lower volume of more concentrated urine." According to Dr. Freeman, ranchers do not have incentive to cause mares to produce more concentrated urine, because the pharmaceutical company contracts for grams of estrogens, independent of urine volume delivered, and pays for all shipping costs. Ayerst Global Pharmaceuticals has guidelines for ranches to follow, the Recommended Code of Practice for the Care and Handling of Horses in PMU Operations. A Continuous Improvement Plan has been developed by veterinarians, quality assurance specialists, and other members of the PMU industry to improve the well-being of the approximately 35,000 pregnant mares on PMU ranches, located in North Dakota and Canada. With the plan, the industry employs field representative inspectors to conduct monthly, comprehensive ranch reviews. Ranchers are required to hire an independent veterinarian to conduct three complete herd health reviews while the mares are stabled. Animal welfare and equine experts are authorized to inspect ranches. The AAEP, Canadian VMA, and International League for the Protection of Horses conducted an extensive ranch review during the 1996-1997 collection season. The veterinarians reported: "Based on our inspections, the allegations of inhumane treatment of horses involved in PMU ranching are unfounded." Linwood Equine Ranch, a working PMU ranch, was purchased and developed as a research and educational facility. A veterinarian manages the facility, oversees herd health, and conducts research. Noting that Linwood is investigating optimal turn-out frequency and mare health, Dr. Freeman said, "There is a lack of objective data that define turn-out requirements for pregnant mares, and critic groups have expressed concern regarding tie stall management of pregnant mares. ... Regardless of the turn-out schedule employed, the monthly inspection and veterinary review processes are designed to identify mares that need additional turn-out." The North American Equine Ranching Information Council is helping PMU ranches raise better foals. 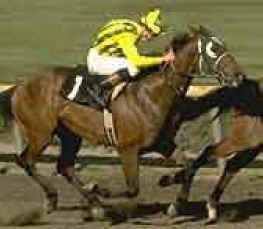 The mares are being bred to Thoroughbred stallions to produce quality sport horses. "Currently, most foals are intended for show, rodeo, recreation, ranch, and replacement markets," Dr. Freeman said. Self-regulation in rodeo has been in place since the sport's beginnings in the early 1900s. According to Cynthia M. Schonholtz, animal welfare coordinator, Professional Rodeo Cowboys Association, the rodeo industry has worked with humane organizations to adopt rules to improve the welfare of rodeo livestock, including horses. 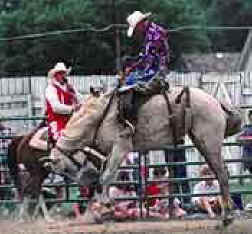 The Rodeo Cowboys Association, precursor to the PRCA, began formally regulating rodeos in 1947. Now, 60 rules govern the care of rodeo livestock, Schonholtz said. Some requirements include dulled spurs, fleece-lined flank straps, and protective horn wraps on all roping steers. All PRCA rodeos are officiated by Wrangler Pro Officials System judges. "Not only are the Wrangler Pro Officials charged with scoring the rough stock rides and flagging timed events, but they are also responsible for ensuring the livestock scheduled for each performance are fit to compete and that all members abide by PRCA rules ensuring the proper care of livestock at PRCA-sanctioned events," Schonholtz said. "Officials must submit a written report following each rodeo that includes many details about the rodeo, including the signature of the onsite veterinarian, arena conditions, and any rule violations," Schonholtz added. The PRCA keeps records of such violations, and violators are punished. According to the PRCA Web site (www.prorodeo.com), "[The violator] may be disqualified for the remainder of the rodeo and fined $250 for the first offense, with that fine progressively doubling with each offense thereafter. Any member guilty of mistreatment of livestock anywhere on the rodeo grounds shall be fined $250 for the first offense, with that fine progressively doubling with any offense thereafter." As many as 40 percent of rodeo bucking horses end up in the sport because they bucked riders off consistently, according to Schonholtz. They come from racetracks, ranches, feedlots, and other venues. Their former owners are assured their horse will have a good home. And, she noted, many are eventually retired to pasture. One of the largest and most publicly known equine industries is racing. Dr. George D. Mundy, general manager and resident veterinarian at a full-service Thoroughbred breeding operation in Lexington, Ky, said, "Racehorses, for the most part, are extremely well cared for, with assigned grooms, around-the-clock monitoring, regular professional care, and individualized training programs under excellent husbandry conditions, all at considerable expense to the owners." Strict regulations have spared the racing industry from being a target for welfare groups in recent times. Issues disputed are science related. It is debatable whether performance is affected by, for example, the use of therapeutic medications such as furo-semide for exercise-induced pulmonary hemorrhages or nonsteroidal anti-inflammatory drugs to relieve pain so a horse with sore muscles can race. Perhaps racing could take on rules similar to those of the endurance horse sport, wherein "The integrity of endurance competition requires that the equine is not influenced by any drug, medication, or veterinary treatment," according to American Endurance Ride Conference rules. Dr. Dane L. Frazier, 1997-1998 conference president and a mixed practitioner in Lebanon, Mo, said, "The two overriding principles on which the organization is based are, first and foremost, the safety of the horse, and second, an even playing field so that the outcome of competition is based primarily on objective performance instead of secondarily on subjective judgment." Animal welfare concerns do not always stem from man-made situations. Disasters can be man-made or natural. Dr. John E. Madigan, professor of medicine and epidemiology, University of California-Davis School of Veterinary Medicine, is an equine clinician, associate director of the large animal clinic for the veterinary teaching hospital, and head of the UC-Davis Veterinary Emergency Response Team. Dr. Madigan was part of the immense rescue effort after Hurricane Floyd in 1999. "Planning for a disaster is often an overlooked aspect of a busy equine practice," Dr. Madigan said. "Key components of a [plan] include identifying possible animal housing, feed and water supplies, sources of tack and animal housekeeping materials, and means of mass transport during evacuations." As we enter the 21st century, changing societal concerns about animals will continue to evolve our ethic for animals. For city dwellers, carriage horses are one personification of equine welfare concerns. "Carriage horses are highly visible ambassadors," said Dr. Jay G. Merriam, carriage horse operation inspector and member of the American Driving Society. To many people, the ethical treatment of carriage horses will override the quaintness of seeing a horse and carriage in a city environment, Dr. Merriam said. "Though these social concerns are certainly issues of great emotion," Dr. Rollin said, "underlying them is a new ethic for animals, rationally articulatable [sic] and defensible, and emerging inevitably from changes in animal use, changes in social demography and culture, and deducible from the Platonic principle that ethics proceeds inevitably from pre-existing ethics."